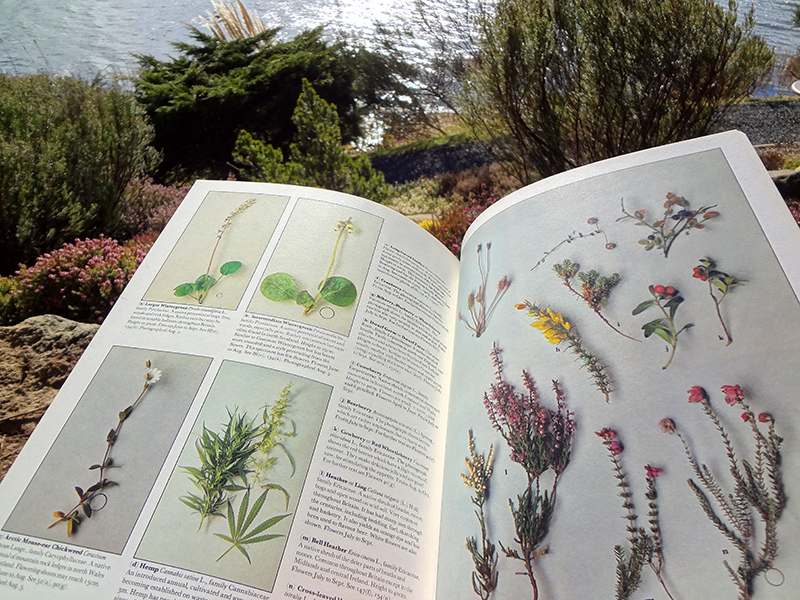 This morning I put on my botanist hat and headed to the east side of town to begin one of the year’s biggest assignments: Locate, identify, harvest, press, and mount 35 native British plants as herbarium specimens. It sounds like a bit of a faff, I know, but it’s actually proven quite challenging for many reasons, the first being that I am not familiar enough with the local flora to identify as many things offhand as I could back in the U.S. So I haul wildflower and plant i.d. books into the field with me, but those are no real picnic to decipher. Second, so many plants that one might believe are native are, in fact, introduced. 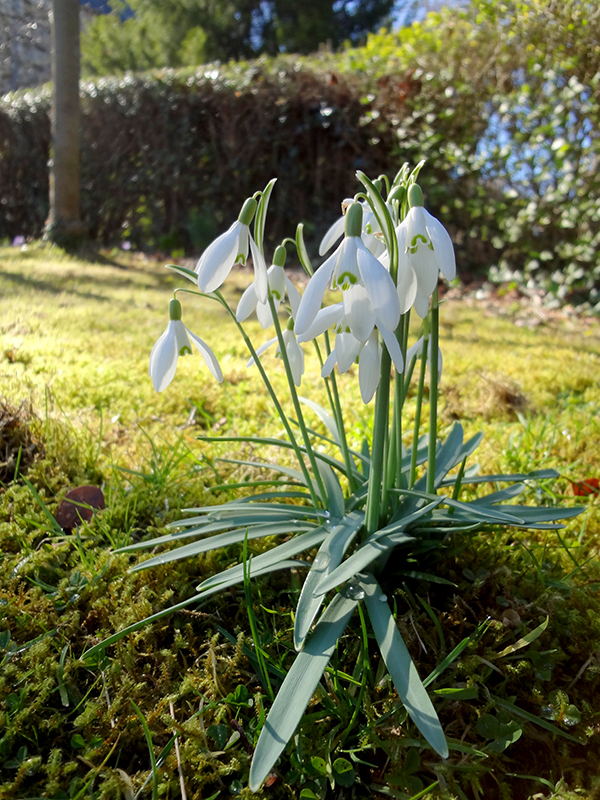 A prime example is the little snowdrop, Galanthus nivalis, which to me and many others is emblematic of late winter in British woodlands. However, it was introduced in the 16th century and then naturalized until it was found in the wild in the 18th century. Finally, the time of year is a challenge as March is just too early for most plants to be actively growing let alone flowering, which limits what I can successfully identify. The assignment is due in May, and it takes weeks to properly dry herbarium specimens so they can be stored without rotting. So I figured I’d better get cracking, even with these odds against me. 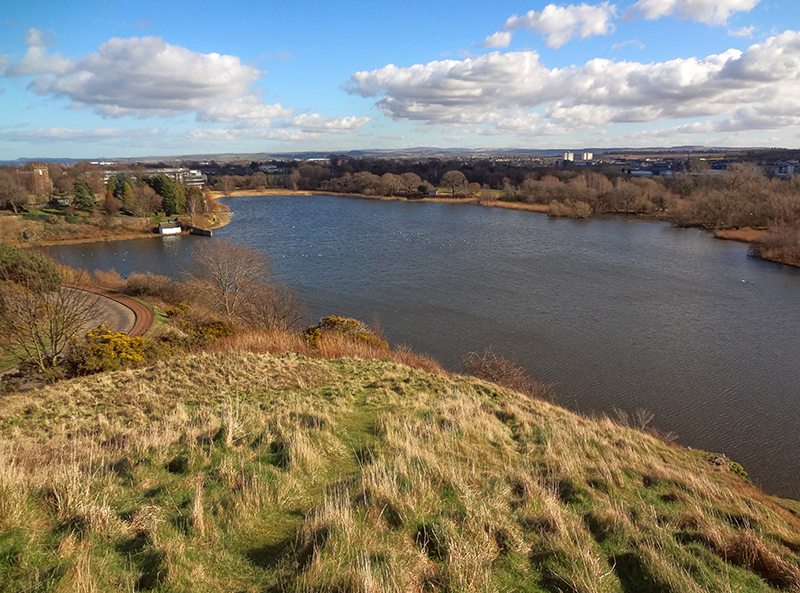 I packed a picnic lunch with a roast pork and chutney sandwich, filled a flask of hot tea, chucked my secateurs into my backpack and headed in the direction of Duddingston Loch, a lake and bird reserve south of Arthur’s Seat. 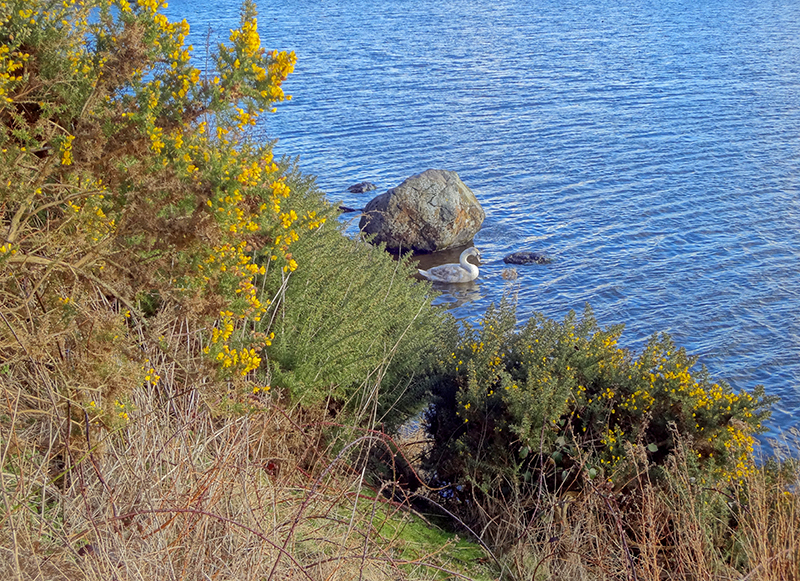 I tromped some woodland on the way, and cut a bits of holly and ivy (yet unidentified) and Scotch Broom (Cytisus scoparius) before I stopped off at Dr. Neil’s Garden to eat my lunch overlooking the beautiful loch. 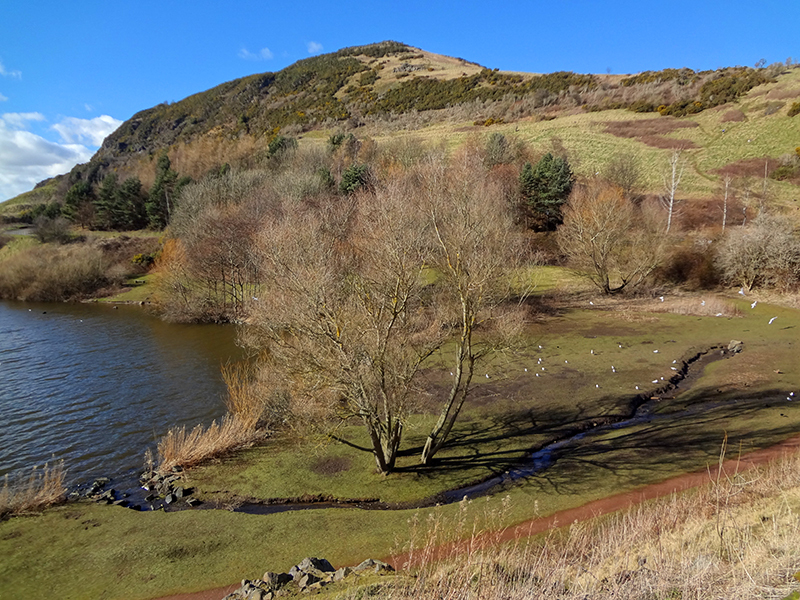 The Pentland Hills in the distance were still covered in yesterday’s snow, and the streaming sun, shimmering water, and myriad swooping and singing birds made for a perfect picnic. I made my way up the garden to a sheltered nook with a great wooden bench. It was warm in the sun, and I lay down. Watching the clouds skid across the sky made me so mellow I fell asleep for at least an hour. I can’t remember the last time I slept outside—I was entirely relaxed. 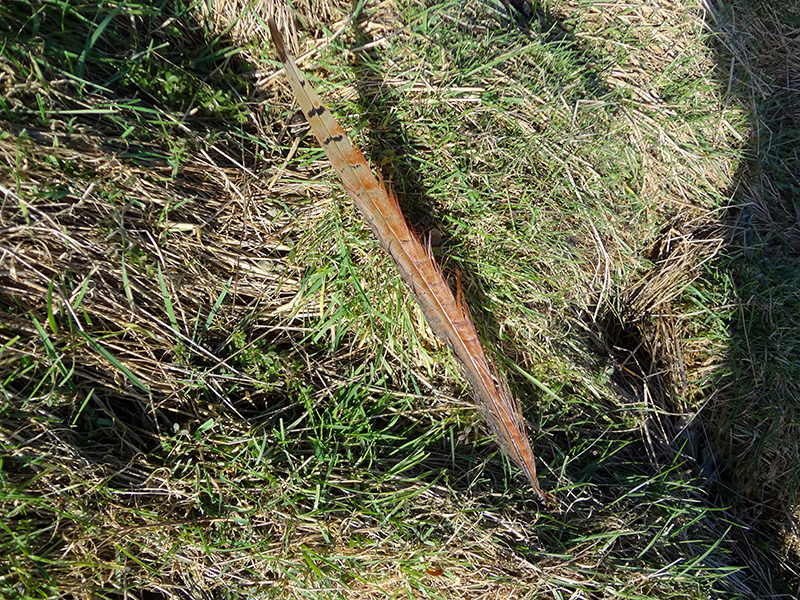 When I woke up I hopped a stone wall and ambled around the loch, climbing amongst the spiney gorse (Ulex europeaus), which of course I cut for my assignment despite being prickered to bleeding. I scrambled up some rocks and found myself on an overhang high above the loch, discovering a beautiful feather along the way. Pheasant? The top of the hill was a great spot to watch the geese, swans, seagulls and other little birds swim below. 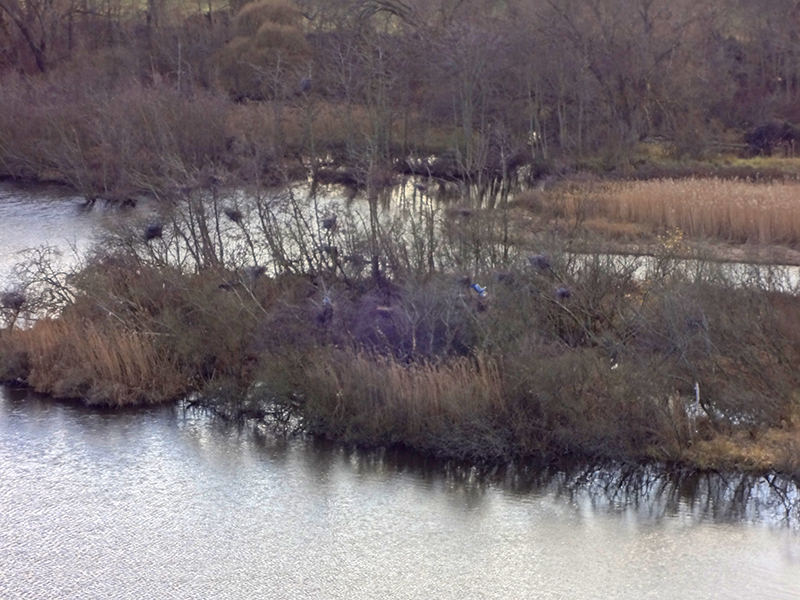 As I was drinking my tea I saw two huge grey herons fly side by side to their nest in a brushy little peninsula. 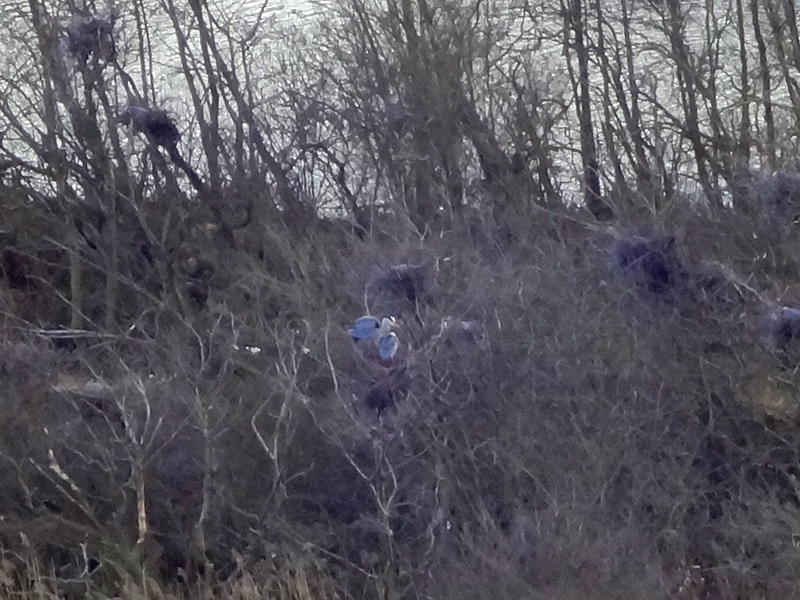 It was an amazing sight, something I’d never seen before—a pair of herons on the nest. It’s egg-laying time. Wish I’d had binoculars! 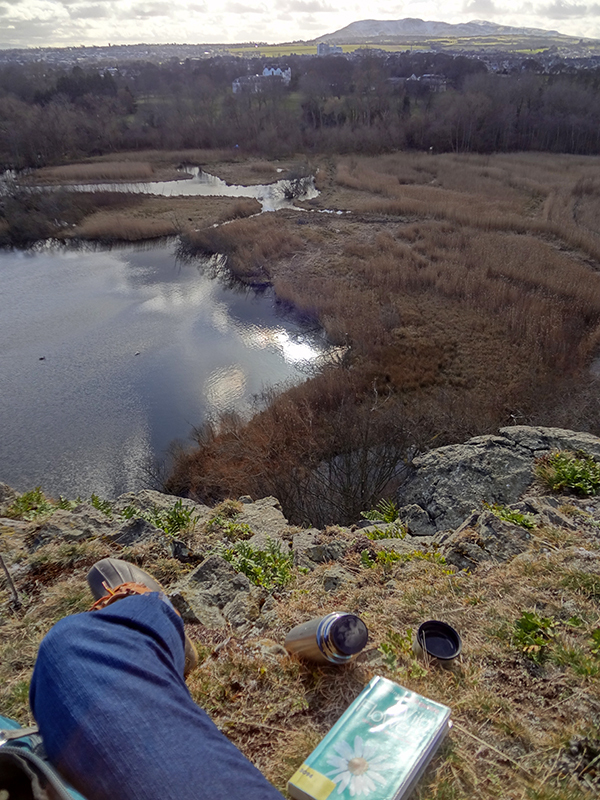 So it turns out that the life of a plant collector comprises a little hiking, lots of fun thinking about plants, a picnic, a nap in the sun, and some birdwatching. 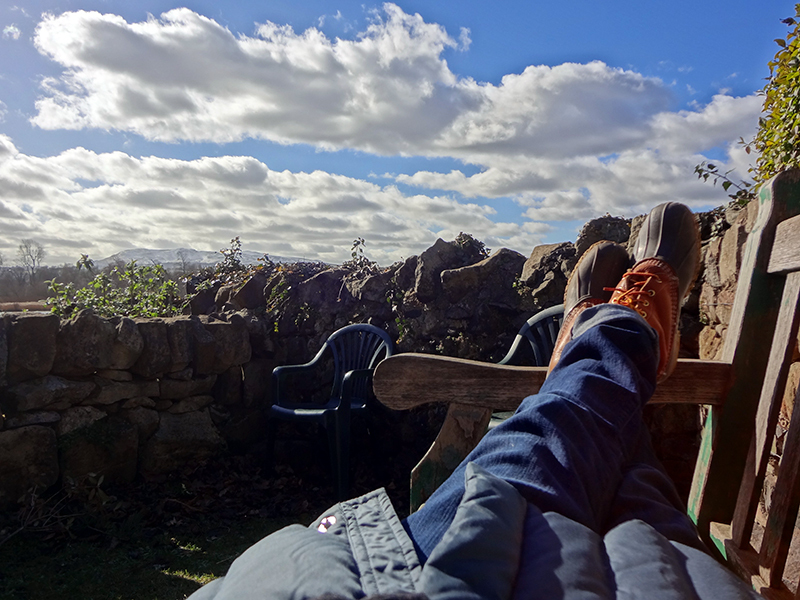 It’s a good life, and added up to one of my favorite days yet in Edinburgh. You are currently reading Life of a plant collector at Bonafide Farm.